The state of Florida has always been known for its juicy and delicious citrus crops. In fact, the Florida Citrus Tower was one of Orlando’s biggest and most vital tourist traps before Walt Disney replaced it with the mother of all tourist traps. That said, the last two abysmal years of citrus business in Florida has made for a pair of very unpleasant chapters in the crops’ ongoing saga. The U.S. Department of Agriculture reports that, for the second year in a row, the orange crop’s yield is expected to be nearly 10 percent lower than the year before. What is the cause, you may ask? Or, is it a combination of factors? For instance, could the citrus problem be at all associated and/or symptomatic of the overarching problems with dwindling pollinators? Well, for now, the answer is no. 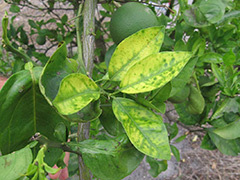 The main culprit, as of this moment, is something called citrus greening—a fruit disease that has wiped out oranges and grapefruits across the Sunshine State and is now spreading to parts of Texas and California. "You could go up and see thousands and thousands [of] acres of trees. And you could buy fresh-squeezed orange juice, or you could buy a bag of navels. So it was a big deal back then." To reclaim some semblance of those glory days, growers eventually moved and set up shop further south. Groves were planted, and business resumed until ... citrus greening reared its ugly head. The scariest part? Despite the fact that the Citrus Research and Development Foundation is entirely dedicated to cracking this fruit disease, there are no solutions as of yet. "I can't imagine Florida without commercial citrus," says CRDF Director Harold Browning. Are Polluters Finally Going to have to Reveal Themselves and Pay? Posted on December 30th under Global Ecology.